Unlike most of our plans, the Mitchell was not inspired by any one historic home; rather, it is a representation of the American Craftsman-style bungalows popular from around 1910 until 1940. These homes are characterized by prominent entry porches with equally prominent decorative columns, decorative woodwork (including extended, carved rafters), moderately steep gabled roofs with large overhangs, and large and numerous windows (often with architecturally different top and bottom sashes). Inside, the kitchen living rooms were prominent and often connected into an ‘open’ floor plan; sometimes, these homes were divided into a ‘public’ side (living, dining, garage, etc) and a ‘private’ side (bedrooms and baths). 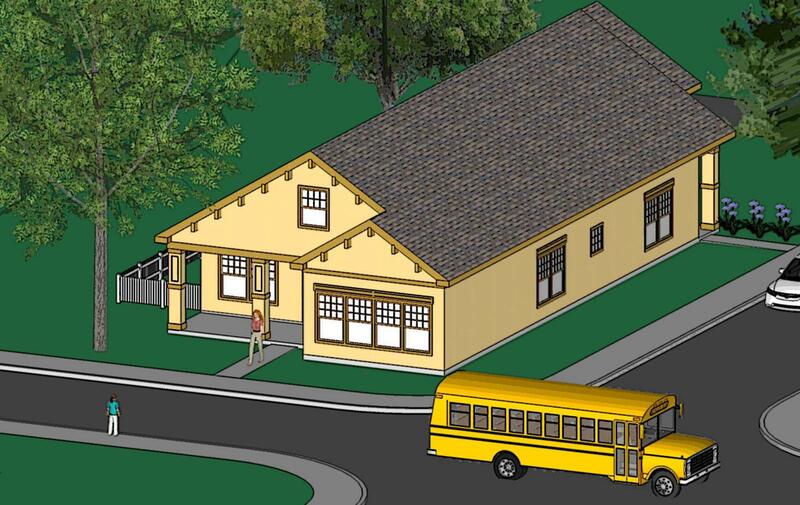 The Mitchell is ideal for a deep lot, or a lot with rear alley access- although the plans include an option for a side-access garage which makes the home also ideal for a corner lot. True to the style, this plan features continuous ‘public’ areas (living, kitchen, dining) on one side and ‘private areas’ (master suite w/ retreat, bedrooms) on the other side and at the rear of the house. We kept the extensive front porch with decorative columns, the large windows with different top and bottom sashes, and the exposed decorative rafters. Additional decorative woodwork, such as the faux exposed purlins shown on the model, are completely optional according to your personal tastes and budget.